An open face helmet and a lap belt seemed to be safe enough. Several years ago, NASCAR started running races on Saturday nights. I found that disturbing. There were times in my life when I really enjoyed watching the Cup Series on television, but I was really a short track racing fan at heart. When NASCAR started adding Saturday night races, it hurt the local short tracks, and those tracks were already struggling. For 2017, NASCAR is holding seven races on Saturday night. On those seven nights, local short tracks will see their crowds shrink. You can’t blame the fans. They are given a choice of sitting on a hard bleacher in the muggy heat for a few hours, or sitting on a soft easy chair in air conditioned comfort without setting foot outside the house. Either way they get their racing fix. Which one would you choose? As much as I love short track racing, I think I would opt for the air conditioning. For a business that’s already on the edge, that loss of revenue can be nothing but destructive. Shame on you NASCAR. Your roots are in short track racing. Go back to Sundays where you belong, or at least reduce the Saturday night races to a couple of the true short tracks you run like Bristol and Martinsville. Yes, Martinsville now has lights in case you didn’t know. Now we get to rule changes. It all started with new safety rules. The first big change was the institution of pit road speed limits after the 1990 season. It’s racing and speed limits don’t make much sense, but that’s okay. Nobody wants to lose a life or see someone else lose a life while standing on a pit road waiting to service a race car. I never thought about it, all the years I went across the wall,” Waddell Wilson said. “The cars would go by you so fast especially at Daytona and Talladega, the speed of them would just about turn you around. They’d come down pit road about as fast as they were running down the race track. That’s how they’d make up time. Then came the end to racing back to the caution and the advent of the “Lucky Dog” in 2003. Davey Allison was long gone. Dale Earnhardt had left. I was torn about this rule change and I guess I just didn’t care much about watching NASCAR any more. I want racing to be safe, but no racing back to the caution? That was an institution. That’s when I started to become less interested in NASCAR. But I want to go back a couple of years, to the death of Dale Earnhardt in 2001, and a guy you may have heard of by the name of Smokey Yunick. If NASCAR and the track owners had listened to Smokey, Dale Earnhardt might still be alive today. If they were sincerely interested in the safety of the drivers before one of them got killed, maybe they would have listened to Smokey. This is an early prototype of Smokey Yunick’s soft wall. 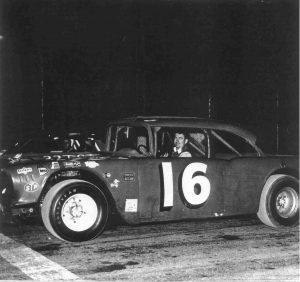 Yunick went home and resurrected an idea that NASCAR had rejected in the early 1960s. It was a different kind of wall — one that had a moveable, soft barrier. 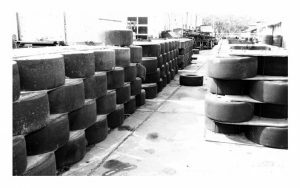 Smokey’s soft walls used old racing tires bound tightly together with thin steel rods and sandwiched between sheets of plywood. The barrier would move on impact. Smokey’s soft walls were ignored by NASCAR in the 1960s and ignored again in the early 1990s. Those walls could have saved a lot of lives over the years. I guess they weren’t really interested in driver safety. But worse than the Saturday night races and worse than the safety rule changes, in my opinion, are the constant rule changes regarding the stock car racing “playoffs.” They make major changes to these rules about every three years and other minor tweaks almost every season, and they always make it more complicated than it was before. All this does is further confuse and alienate race fans. It’s so bad that NASCAR has an entire FAQ page on their website devoted to their convoluted championship system. “The Chase” is nothing more than a cheap gimmick. NASCAR didn’t get popular on gimmicks. It got popular because real men put everything on the line and fought tooth and nail to win. It was personalities like Smokey Yunick, the Allisons, Cale Yarbrough, David Pearson, Dale Earnhardt, Bill Elliot, and a whole host of other great drivers and fine mechanics who put NASCAR on the map. If you’re going to use gimmicks, why not go all the way, NASCAR? Give us some real gimmicks. How about some school bus races? Skid plate racing would be funny at Talladega. Put up some ramps and let’s see who can get the most air. I’d be up for a good demolition derby in the infield at Bristol. Set some cars on fire or something. Bring in some chimpanzees, they’re always hilarious. Blow up some stuff. Everybody likes explosions. Now fans are just confused. Potential new NASCAR fans who haven’t watched much racing (of which there will likely be few with this ridiculous points system) aren’t going to understand it and they will simply turn off and go to the next sport or do something else to pass the time. Their dollars will go elsewhere. Now the races run in three segments. There’s a new flag with green and white checks to end each stage. I guess that makes everybody feel better? This is nothing more than “competition yellows.” I never liked those much either. You can’t engineer a good race. It has to happen organically. When you start planning a race down to the nth detail you just ruin it. I guess the top 10 drivers at the end of each stage get some points. I’m already bored with it. The stage and race winners get extra playoff points, and those are carried over to the postseason. There will be a regular season champion, decided by the driver who earns the most points during the “regular” NASCAR season. There are more points awarded for various things but it all gets so complex and BORING. It’s just too much to keep up with. Baseball has innings, but nobody gets rewarded for leading at the end of one. Football has quarters and halves, but again, nobody gets anything special for leading at the end of a segment. I smell driver input on this. Maybe the drivers wanted a little break so they could go check their hair and makeup and tinkle. I don’t know, But endurance of both man and machine once played a major role in the long NASCAR races. NASCAR has in part removed one aspect of the competition by breaking the races into segments. I have a great idea. Why not just run a full race in one segment, then award the winner of the race a set number of points, then drop the points awarded for each position by a few, or something like that? You could even give a driver bonus points for things like leading a lap or leading the most laps. That’s known as awarding consistency throughout the season. Then you could just do away with the “Chase” and all that gimmicky nonsense. Keep it simple, stupid. It’s actually stunning when you compare the look of an old Dirt Track Racing simulation to the modern, sophisticated products that are at our fingertips today. There have been a lot of changes in the last fourteen years. It’s a giant leap from Dirt Track Racing 2 to iRacing Dirt. In fact, there is no comparison. Of course prior to Dirt Track Racing 2 there was Ratbag’s Dirt Track Racing, which I actually liked better than Dirt Track Racing 2. In between then and now, there were the rFactor dirt modifications which were a little better in some ways than the old Ratbag titles, but for some, including me, they lacked some kind of immersion.Now comes iRacing, finally providing a quality dirt racing simulation that’s not just another arcade game. iRacing is not perfect, but the actual simulation is very good, certainly the best you’re going to find today, and it’s the only game in town if you race on any kind of oval race track including dirt tracks. Yesterday is history. Today we wait. Tomorrow comes on March 29, 2017. Be there or be nowhere. I have created a league for dirt racing which appears to be right around the corner. Join here if you’re interested. We will see what iRacing releases first and continue from there. I’m hoping we can start testing, practicing, and hosting races in Street Stock and/or other cars soon, then move on to serious league racing in the near future. Each separate class/car will have its own league under the OSR name. I expect the league to eventually become a dirt league, but I would like to continue running some asphalt if time permits. This Friday night, the Modifieds will race at Concord Speedway in the late afternoon. Practice begins at 9:00 pm eastern time with qualifying at 9:30 and racing at 9:35. We will be using this setup: [wpfilebase tag=file id=2035 tpl=filebrowser /]. Sunday night, the Pro Street Stocks visit the high banks of Bristol Motor Speedway for a race under the lights. The setup for this race is not a baseline setup. Instead, I made a small camber adjustment on a setup I built earlier this season and selected it for the league race. After thoroughly testing both setups, I found that the one selected is faster and stays faster longer than the baseline I made for Bristol. Bristol is a tricky place so it would be good to try to get some practice on this setup: [wpfilebase tag=file id=2032 tpl=filebrowser /]. For our feature race of the weekend, the Late Model Stock Cars head to USA International Speedway Sunday night at 9:00 pm eastern for a long 75 lap night race. USA is pretty amazing at night so this will be fun. We will use this setup: [wpfilebase tag=file id=2034 tpl=filebrowser /]. It says baseline, but this setup runs like a flaming pig. It’s not too much different from the other setup I built for USA this season which you can get on the iRacing Late Model Setups page. If you have been around the sim racing community for at least ten years, you are most likely familiar with Ratbag Games, an Australian company that released several dirt track racing simulations and games for the PC, PlayStation 2, and Xbox. Ratbag Games, initially known as Emergent Games, was founded in Adelaide, Australia in 1993. Their first title, released in 1996, was a futuristic arcade racing game called Powerslide. They utilized their own highly advanced rendering system (for its time) called the Difference Engine, that allowed up to 300,000 polygons on the screen at once. Midway games acquired Ratbag in August of 2005, then promptly closed the Ratbag operation in December, putting about 75 people out of work with little notice. Krome Studios hired many of the Ratbag Games staff and established Krome Studios Adelaide. Krome Studios never attempted to create any type of racing game or simulation. Ratbag was dead. Dirt Track Racing 2 continued to be used in online multiplayer league racing despite its quirky bugs and ten player limit until at least 2014, however the community is tiny. It seems ten slots is about all that’s needed, as that is about how many were still playing the game at that time. Gamespy drove the final nail in the Dirt Track Racing 2 coffin May 31, 2014 when they took their multiplayer matchmaking/browser server offline. DTR2 was dead. I’ve played Dirt Track Racing 2 as recently as 2014. While it was a great dirt racing simulation for its time, it did have some bugs that never got patched despite the fact that Ratbag remained in operation for two years after its release. The Difference Engine was considered great at that time, and maybe it was, but NASCAR Racing 2003 Season came out during the same year and had better physics and better graphics. The graphics never looked very realistic in the Ratbag titles, and the physics felt like you were driving on asphalt. There was no power sliding, even in the Late Models. You lost too much momentum. It was pretty much an asphalt driving experience. Fast forward to today. Big Ant Studios with Ratbag’s Mark Bracken as Executive Vice President is looking to fund a new Dirt Track Racing game using a Kickstarter campaign. The project will only be funded if they raise at least $266,000. As of this writing, half of the time has elapsed and the pledges stand at only $52,278. But hold on just a minute. First of all, Mark Bracken was a marketing guy at Ratbag, not a game developer. His official title was Vice President of Marketing and Business Development, which is a fancy name for a salesman. Then we see TeamVLR listed as a consultant. Seriously? Is this supposed to impress me? TeamVLR is a guy who ran a Dirt Track Racing 2 league for a few years. There’s nothing wrong with that, but he has no game development experience. It’s starting to sound a lot like name dropping. Ratbag. TeamVLR. DirtWorks Designs. Okay hold on just another minute. DirtWorks Designs does get my attention. That’s a name I recognize as the leading developer of mods for various dirt racing simulations, primarily rFactor. I really liked the DWD Stocks and Super Stocks. This is a plus. As you read the details of the project, the $266,000 only covers a base package that does not include any other chassis, and, most importantly, will not support online multiplayer racing. To get the good stuff, Bracken is looking to raise $830,000. I thought $266,000 was ambitious for a 30 day campaign, but $830,000 is nothing short of ridiculous. Anybody can look at the numbers and see that. They’ve raised 50k in 15 days. There is no way in hell they’re going to raise almost 800k in 15 days. Now that I’ve said that and it’s settled, I will say this: If Big Ant Studios somehow gets close to the $830,000 mark, I’ll contribute enough to make it happen. But it’s just not going to happen. This Kickstarter campaign is DOA.